Danny Gill is a former student of Joe Satriani and co-author of the Musicians Institute "Rock Lead Guitar Series". When not writing books or teaching and playing in bands, he has had the good fortune to work with a music publisher (Mastersource Music Publishing) who has successfully placed many of his guitar compositions in movies and TV shows. Some of these include: The Osbournes, Insomnia, Under Siege, Days Of Our Lives, Access Hollywood, and Nash Bridges. Danny now spends most of his time in Sweden. He has also starting working with a great company in England (Lick Library) and has now recorded over 35 instructional DVDs for them! Week 1 includes: Power chords, minor pentatonic scale pattern #1, blues scale pattern #1, minor pentatonic and blues scale licks, bending, vibrato, hammer ons, pull offs, and slides, and 3 important licks in the style of Slash. Includes killer rock jam trax! Week 2 includes: Minor pentatonic and blues scale pattern #2, connecting patterns, sequences, pre-bends and rhythmic bends, and 3 important licks in the style of Jimmy Page. Includes killer rock jam trax! Week 3 includes: Major pentatonic scale, major blues scale patterns #1 and #5, minor pentatonic pattern #5, connecting patterns, combining major and minor blues scales, double stops, and 3 important licks in the style of Angus Young. Includes killer rock jam trax! Week 4 includes: Minor pentatonic and blues scale patterns #3 and #4, harmonics, 3 notes per string minor pentatonic scale, connecting the entire fretboard, and 3 important licks in the style of Zakk Wylde. Includes killer rock jam trax! Week 5 includes: Major pentatonic and blues scale patterns #3 and #4, relative scales, harmonizing the pentatonic scale, playing with space, and 3 important licks in the style of Joe Satriani. Includes killer rock jam trax! Week 6 includes: Major pentatonic and blues scale pattern #2, soloing over changes, adding chromatic notes, review of all 5 major and minor pentatonic scale patterns, review of all 5 major and minor blues scale patterns, and 3 important licks in the style of Eddie Van Halen. Includes killer rock jam trax! Learn to improvise, compose and recognize modal music. Also includes a guitar jam track and licks in the style of Carlos Santana. The modes of the major scale have been used for centuries as a compositional tool and as a source for improvisation. This excellent DVD series will to take you through each of the 7 modes step by step so that you will be able to improvise, compose and recognize modal music. Each DVD includes licks in the style of a featured artist and a guitar jam track. The Dorian Mode tutorials include: Dorian scale patterns � finding the relative major scale (Ionian mode) � superimposing triads � finding the right note � creating Dorian chord progressions � Dorian mode licks including alternate picking and tremolo picking � and three important licks in the style of Carlos Santana. Danny Gill is a former student of Joe Satriani, and co-author of the Musicians Institute Rock Lead Guitar series. Learn to improvise, compose and recognize modal music. Also includes a guitar jam track and licks in the style of Slash. The modes of the major scale have been used for centuries as a compositional tool and as a source for improvisation. This excellent DVD series will to take you through each of the 7 modes step by step so that you will be able to improvise, compose and recognize modal music. Each DVD includes licks in the style of a featured artist and a guitar jam track. The Ionian Mode tutorials include: 5 patterns of the Ionian mode � 7 three note per string patterns � creating chords using the Ionian mode � connecting the neck � Ionian mode licks including sequences � bending and double stops � and three important licks in the style of Slash. Danny Gill is a former student of Joe Satriani, and co-author of the Musicians Institute Rock Lead Guitar series. Learn to improvise, compose and recognize modal music. Also includes a guitar jam track and licks in the style of Joe Satriani. The modes of the major scale have been used for centuries as a compositional tool and as a source for improvisation. This excellent DVD series will to take you through each of the 7 modes step by step so that you will be able to improvise, compose and recognize modal music. Each DVD includes licks in the style of a featured artist and a guitar jam track. The Locrian Mode tutorials include: Locrian scale patterns � finding the relative major scale � recognizing and creating Locrian chord progressions � Locrian arpeggios � Locrian licks including legato technique � pick tapping and open string licks � and three important licks in the style of Joe Satriani. Danny Gill is a former student of Joe Satriani, and co-author of the Musicians Institute Rock Lead Guitar series. Learn to improvise, compose and recognize modal music. Also includes a guitar jam track and licks in the style of Steve Vai. The modes of the major scale have been used for centuries as a compositional tool and as a source for improvisation. This excellent DVD series will to take you through each of the 7 modes step by step so that you will be able to improvise, compose and recognize modal music. Each DVD includes licks in the style of a featured artist and a guitar jam track. The Lydian Mode tutorials include: Lydian Scale Patterns � finding the relative major scale � recognizing and creating Lydian chord progressions � Lydian arpeggios � Lydian mode licks including tremolo bar techniques and harmonics � and three important licks in the style of Steve Vai. Danny Gill is a former student of Joe Satriani, and co-author of the Musicians Institute Rock Lead Guitar series. Learn to improvise, compose and recognize modal music. Also includes a guitar jam track and licks in the style of Eddie Van Halen The modes of the major scale have been used for centuries as a compositional tool and as a source for improvisation. This excellent DVD series will to take you through each of the 7 modes step by step so that you will be able to improvise, compose and recognize modal music. Each DVD includes licks in the style of a featured artist and a guitar jam track. The Mixolydian Mode tutorials include: Mixolydian scale patterns � finding the relative major scale � recognizing and creating Mixolydian chord progressions � Mixolydian arpeggios � Mixolydian licks including two hand tapping and slides � the dominant pentatonic scale � combining Mixolydian and blues � and three important licks in the style of Eddie Van Halen. Danny Gill is a former student of Joe Satriani, and co-author of the Musicians Institute Rock Lead Guitar series. Learn to improvise, compose and recognize modal music. Also includes a guitar jam track and licks in the style of Yngwie Malmsteen. The modes of the major scale have been used for centuries as a compositional tool and as a source for improvisation. This excellent DVD series will to take you through each of the 7 modes step by step so that you will be able to improvise, compose and recognize modal music. Each DVD includes licks in the style of a featured artist and a guitar jam track. The Phrygian Mode tutorials include: Phrygian scale patterns � finding the relative major scale � creating Phrygian chord progressions � Phrygian mode licks including sweep picking � hammer ons and pulls offs and pre-bends � solo development � recognizing Phrygian songs � and three important licks in the style of Yngwie Malmsteen. 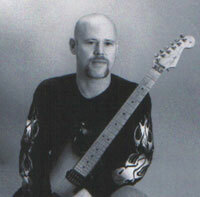 Danny Gill is a former student of Joe Satriani, and co-author of the Musicians Institute Rock Lead Guitar series. Take your guitar playing to the next level and learn some cutting edge licks to help you stand out from the crowd! One of the mainstays of '80s shred guitar, sweep picking is a technique that often draws negative connotations due to the relationship it has with playing fast. In this DVD, Danny Gill dispels these misconceptions with 51 licks to help develop your sweep picking technique without resorting to the old clich�s of major and minor patterns. From more modern sounding suspended arpeggios to position shifting and scalar ideas using the economy of sweep picking technique, this is the DVD for you! Featuring high quality video lessons and tablature, there's something here for every guitarist! Take your guitar playing to the next level and learn some killer two handed tapping licks! In this excellent DVD, Danny Gill walks you through 51 licks in a variety of styles using the two handed tapping technique. Beginning in the style of rock players like Joe Satriani and Steve Vai, Danny quickly moves into more creative ideas in the style of Steve Lynch and T.J. Helmerich before moving on to Eddie Van Halen style tapped harmonics, Lenny Breau style harp harmonics, and chordal tapping like Tosin Abasi! Take your guitar playing to the next level and learn some cutting edge licks to help you stand out from the crowd! This fantastic DVD features 50 licks covering a variety of styles, from bebop influenced jazz licks, to hot country licks, soulful blues licks, up tempo rock licks, and finger twisting shred licks! World respected instructor Danny Gill takes you through each lick one note at a time to help you take your guitar playing versatility to the next level. Along with the high quality video instruction, this DVD comes complete with an 11 page downloadable tab booklet containing all of the licks so you don't have to worry about getting lost! One of the most frequently asked questions in the field of guitar education is "what do I practice"? This excellent DVD series provides lessons and pieces of music exclusively written for practicing essential guitar techniques. By combining the technique lessons with the music and learning the pieces from start to finish, you will not only improve your technical ability, but also get a great sense of achievement and fun from practicing and perfecting your alternate picking! Expand and develop your string-skipping technique with Danny Gill. One of the most frequently asked questions in the field of guitar education is �what do I practice"? This excellent DVD series provides lessons and pieces of music exclusively written for practicing essential guitar techniques. By combining the technique lessons with the music and learning the pieces from start to finish, you will not only improve your technical ability, but also get a great sense of achievement and fun from practicing and perfecting your string skipping! Harmony and theory is the language of music! It is what allows musicians from all over the world who may speak different languages verbally to speak the same language on their instrument. Starting with the basics, this DVD will guide you through the notes on the neck, the major scale, major and minor triads, intervals, note values and harmonizing the major scale. Each example is clearly demonstrated and performed with a backing track which is also included for you to play along with! Harmony and theory is the language of music! It is what allows musicians from all over the world who may speak different languages verbally to speak the same language on their instrument. This DVD will guide you through the minor scale, relative keys, diatonic 7th chords, pentatonic scales, blues chord progressions, blues soloing and extended chords. Each example is clearly demonstrated and performed with a backing track which is also included for you to play along with! Harmony and theory is the language of music! It is what allows musicians from all over the world who may speak different languages verbally to speak the same language on their instrument. This DVD will guide you through the major scale modes, the harmonic minor scale, the melodic minor scale, modal interchange, secondary dominants, and the diminished scale. Each example is clearly demonstrated and performed with a backing track which is also included for you to play along with! Learn five songs note-for-note with this outstanding DVD taught by Danny Gill featuring the original three guitar line-up of Lynyrd Skynyrd, including one of the greatest rock anthems ever from these Southern rockers. Songs include: "Freebird � Sweet Home Alabama � Simple Man � Tuesday's Gone � Gimme Three Steps". All guitar parts transcribed note-for-note from the original recordings. Learn to play Paganini�s Caprice #24 on electric guitar with Danny Gill. The 24 Caprices have been hailed as some of the most challenging musical pieces ever written. Danny has taken this music and translated it to the electric guitar to provide a wealth of melody, harmony and killer guitar licks! Although not for the faint hearted, completing this solo violin piece will not only make you a better guitar player, but will also put you out there with some of the best technicians in the world! !